Today,Wed 12/23/15 I went to visit my luthier, Mark Schwartz, I haven't been there in a few weeks. When I walked in he greeted me with a hand shake. After a few minutes of chit chat he said "I have been in contact with your man, LOL. I said, you mean "Fiddlerman" ? he said yes. Then he walked over and opened a violin case. He grabbed a bow off a shelf, handed it to me and said, "here, play it". 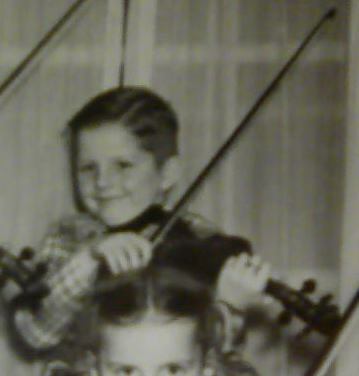 I asked what is this, he replied, "a Holstein violin", so I played it and asked which model it was. The "Holstein Plowden" he replied. I asked when he got them and he said, "they came in on Monday"
I liked it, the sound jumped out at you. It IMO is a quality violin. I'm going back next week to get another shot at playing the other two models he has. The "Holstein Panette" and I believe, the "Holstein Soil Strad"
Who know's, one of them may just be residing in my home. Hey Ken.. I love to hear that you got to play one!! Merry Christmas to you Ken. Thanks for sharing Ken. Let us know what you think of the other models as well. I had planned on and told, Toni A.K.A Coolpinkone and Diane, A.K.A. KindaScratchy in FiddlerChat the other evening that I planned on going back on Saturday after Christmas and doing a video in Marks shop. I wanted to play the "Panette 1737", but I was wrong in my last post about which violins Mark has. He doesn't have the "Panette", but does have the, "Soil" and, "Plowden" and I can't remember the other one. (I gotta start writing things down at my age) LOL. I told Mark I wanted to try the, "Panette" and he said he didn't have it. He asked if I wanted him to get it for me. Anyway, I didn't do a video because he was too busy re-hairing bows and had several customers to deal with, maybe next time. He asked how I was doing on my "kit" violin, when I returned the three (very small) graduating planes he loaned me several months ago. I told him I needed to be able to check the thickness of the top, but didn't have graduation calipers. I said I was going to order a caliper on "Amazon" and his reply to me was, "you buy them and when you are finished using them, I'll buy them from you for what you paid for them". He seems like a great guy. Say hi from me. No, he had the Soil, the name tags are on the cases. I will say hi, from you, Pierre.